Basic colour: Bright metallic blue, sometimes purplish, rarely bronze-brown or brassy. Host plant: Various Brassicaceae, including Water-cress; sometimes on flowering gorse. Overwintering: Adults hibernate from October to April. Food: Leaves of host plants (adults may also feed on gorse pollen). Other notes: Similar to C. armoraciae, but without the basal elytral impression along stria 5. It can also be confused with the rare metallic blue form of P. concinnus. 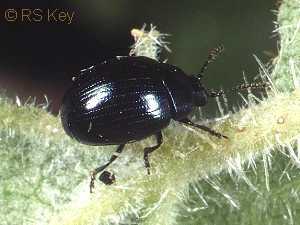 However, in P. concinnus, the antennae are entirely black; in P. cochleariae, the underside of the 2nd & 3rd antennal segments are reddish (or at least with a reddish spot). Read, R.W.J. (1992). Swimming in Phaedon cochleariae (F.) (Chrysomelidae). The Coleopterist 1(3): 27.